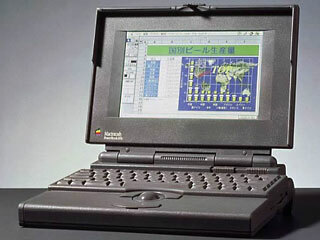 Essentially a PowerBook 180 with a color display, the 165c brought the first color screen to the PowerBook line. It was also the first notebook computer from any manufacturer with 256 colors on its internal display. The passive-matrix screen supports 8-bit video at 640 x 400 pixels. Other than the color screen and faster CPU, it is identical to the PowerBook 160. Because of the color screen, a fully charged battery lasts about one hour. One serious design compromise was Apple’s adoption of single-ported DRAM for video instead of double-ported VRAM, as was used in the 160 and 180. This significantly slowed screen redraws and gave the 165c a sluggish feel during screen updates. The screen itself has been described as murky. The PB 165c has a 14 MB memory ceiling, although you can go beyond that by using Virtual Memory (slow and free) or RAM Doubler (faster, not free, and discontinued). Another option is RAM Charger 8.1, which offers better memory management than the Mac OS. Picking a low-end colour PowerBook, Adam Robert Guha, Apple Archive, 2000.11.10. If you want color and portability, but don’t need PowerPC speed, here are your options.